What is the secret of bars? Why do we happily pay four times as much for beer in a bar as in a store? We pay this brand premium to be with friends. The secret of bars is that they convert our quality time into cash. Like bars, social media are places where friends meet. The best social media programs also convert the consumer’s social time into a brand premium, reaching a return on investment (ROI) up to four times as high as the ROI of a TV commercial. Marketers promote the brand, just like waiters in a bar do. Some of the fans and followers listen but rarely pass the commercial messages along. As a result, the stream of service messages and sales promotions on sites like the JetBlue Twitter account offers the airline’s 1.7 million followers hardly any quality time. Bloggers, tweeters, and vloggers use branded content to make a good impression on the strangers and acquaintances that come to their online venue. Some of the readers start a dialogue, and when it clicks, the blogger and engaged reader will often agree to meet face-to-face, according to a study by Technorati. Friends converse with each other. Consumers pick up branded content and “like” and share it with friends. Some comment and chat, often with close friends. TOMS Shoes, for one, feeds these dialogues on its Facebook page. The shoe brand gives one pair of shoes to children in third-world countries for every pair it sells. With daily footage of delighted children and articles about poverty, the brand gives fans food for thought and conversation. A consumer, let’s call her Lucy, walks into a bar wearing her TOMS. The label on her shoes tells everyone what she stands for. She sits down with a friend, sharing the story of the brand’s benevolence. The TOMS label is a social signal in the offline bar. In online bars, fans and followers give the same social signals when they “like,” comment, share, retweet, and repin a brand. “Likes” are the new logos. When Lucy clicks on “Like” and comments “I love my new toms” on the brand’s fan page, she is telling her friends, neighbors, and colleagues who she is, what she stands for, and where she belongs. Lucy’s contacts see her online signals. An acquaintance will take note, a friend may click on “Like” herself, and a close friend or relative may add a comment: “They look so good on you, Luz ☺” Lucy’s signals and the responses are directed at consumers, not at TOMS Shoes. But TOMS benefits big time from these peer interactions. A sociological study by the Rotterdam School of Management shows that after seeing Lucy’s signal, 7% of her acquaintances will consider the brand, and 42% of her close friends will want to own a pair too. Compare that to the mere 5% of consumers who get interested after they see a TV commercial: due to social interactions, consumers make an 840% leap of faith into the brand! Each time Lucy and a friend share a brand experience, they invest time and trust. Each touchpoint between consumers represents value to the brand. That value is positive or negative, depending on the sentiment the two consumers exchange: a friend bashing the brand cancels out two “likes” by other friends. Either way, that value means money, because time is money for both consumers. Just like in offline bars, that value represents the brand premium both consumers are willing to pay. Add up the value of the thousands or millions of touchpoints between friends, acquaintances, and strangers in a social media program and you get the total brand premium that consumers are collectively willing to pay. By definition, this collective premium is the rise in brand equity: the return on investment of the social media program. Count every time a branded YouTube video was downloaded, every “Like”, and every view of the company blog, every visit to the discussion forum. You don’t know how many fans saw your Facebook post or tweet? Thanks to research by people like Dan Zarella, marketers can make a pretty sound assessment of how many friends and followers digest their content and pass it along by tracking the likes-per-fan and retweet ratios. Look at the intensity of the online interactions between consumers to assess how close they are. A good metric for intimacy is the comment-to-like ratios of Facebook fan posts: the higher these ratios, the more close friends shared the brand experience. On Twitter, the retweet-to-tweet ratio is a solid indicator. Social marketers know the demographics of their fans and followers, including the net income of senders and receivers of their content. 1. The ROI of social media is up to four times as high as TV commercials. Consumers pass the branded content along and add trust every time they do. 2. Both large and small campaigns and programs can achieve high returns. The closer the senders and receivers of branded content are, the higher the impact on the brand. 3. In the most successful campaigns, consumers do the talking. Marketers don’t have the time to chat with every fan and consumers prefer to talk with each other anyway. You are more than welcome to use this tried-and-tested interactive model to verify the ROI of your brand’s fan page, Twitter account, email campaign, Pinterest Board, or other social media activities. Download the model and find out how much money your social media campaign or program is making your company. How many followers clicked on the Bit.ly link in the tweet? How many readers followed the hotlink in the company blog post? Did the user of our mobile app scan our product in the store? How many non-fans read our post according to Facebook analytics? Correlation analysis and A/B testing. Do peaks in sales follow surges of “likes”? Do fans and followers behave differently than other customers? Without answers to these questions, the ROI of social media is just a number. With the answers, that number becomes a valuable benchmark to measure your performance against the best-in-class campaigns. You uncover which investments will bring social marketing to the next level. You connect the dots and deliver the number. This formula should scare the hell out of the ad agencies who’s income relies on building campaigns that can’t be measured definitively. Being that I’m a direct response marketer who only eats what he kills, I love it. Just like in the direct mail industry where response is tracked to the nth degree, this kind of formula can really help weed out the ad agencies more concerned with winning industry awards and bilking clients for as long as they’ll fly blind and take it than they are in getting more business for their clients. Hey Lewis. Nice point. I have been fortunate to field-test the theory with a few leading agencies, who used this formula to make their campaigns more “awarding” with content that suits conversations between close friends. They won pitches when using the ROI model to predict the campaign results. I sincerely believe that in the end, great marketing is a combination of art and craft–this formula is to help agencies with the latter :). This is the first model I have come across that seems to make perfect sense. Many thanks Jaap. What a very interesting read and a different way of thinking about things. Thanks Jaap! Seriously?! No Android app? Only iPhone? You do know that the gap between Androids selling more than iPhones here in Europe, is widening by the week right? channel to determine the campaign’s overall effectiveness and efficiency? visitors and their conversion rates. worth if it varies so greatly by age, gender, and geographic location? sales) through macro and micro conversions. 1) Inside-out. A brand looks at investments (in media, production, etc.) and sorts out a way to attribute certain lift in sales to these investments. This is a complex process, but with the help of companies like MetrixLab and Millward Brown it usually leads to a good insights in the ROI of (social) media. Due to the complexity, however, this method is time-consuming and expensive. My advice to brands is to perform such studies once or twice per year as benchmark for the overall marketing mix. 2) Outside-in. A brand looks at the investments consumers make. This could be investments when buying their product (the brand premium they pay) or investments in time. The theory presented here is outside-in. Using various proxies for time, trust, sentiment and income, the resulting model provides accurate results in a matter of minutes. That makes, in my view, this theory very helpful for daily use by marketers, when they need to pitch to clients;request campaign budget from the exec team; develop social brand experience and assess its effect; optimize the media mix; and audit their campaigns. In short, what I would propose to marketers is to use both the method that you suggest and the method presented here. They complement each other. Thank you for your additional thoughts on a subject that I find just fascinating. As a Digital Marketing Specialist, I have realized the importance of benchmarking and looking at a variety of measurements to gauge the effectiveness and efficiency of the media mix. Once processes are put in place, metrics can become less complex over time whether it be through internal analysis or with the help of an agency as you mentioned. Again, I appreciate the professional banter and your willingness to see both sides of the spectrum. I look forward to reading your future blog posts. I think measuring ROI involves internal departments getting very close. The social media team needs to communicate with sales to understand where people are coming in from. 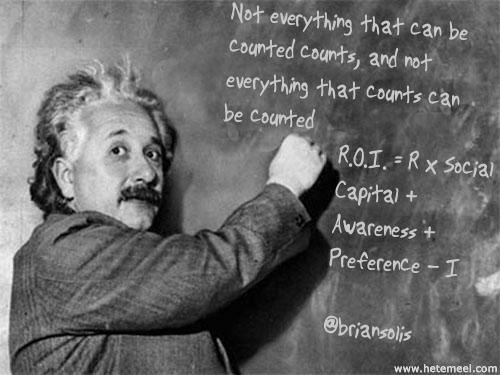 Measuring ROI is only as good as your internal communication structures allows. Jaap, great article, and great analogy. Thanks David. I’ve done some more calculations using this method. For instance: Starbucks versus Dunkin Donuts. In blind testings, consumers prefer Dunkin’s coffee, yet in the market they are happy to pay $1 brand premium for Starbucks’. Why? Because they spend on average 4 minutes more at Starbucks than at Dunkin Donuts. 4 minutes equates raugly to $1 of working time. Add up all the time that all patrons spend at Starbucks, and you get to $3.6 billion per year (2011). Interbrand values the brand Starbucks at $3.7 billion. If you accept the definition of business performance, namely that ROI is the evaluation of financial outcomes versus investment, then this approach is flawed. You attempt to simplify the measurement of social media to a series of variables – at best crude proxies for success – that are multiplied together to deliver a so-called ROI number. I don’t think any CFO would recognise this as a measurement of ROI. If it works for your campaigns then great but it’s a planning tool at best for your organisation and not a magic bullet to evaluate the ROI of a social media campaign. I completely agree with your point that both an “R” and an “I” are inlcuded in ROI. Marketers are generally well aware of the “I” part (their budget), but struggle to assess the “R”. This blog post and the ROI model are intended to help them with that part and to let them make educated decisions while planning, running and auditing their programs. The ROI model is indeed a planning tool and not a financial reporting tool. My team is however constantly improving this model with the more than 100 readers who have downloaded it over the past week. I interpret your feedback, and the comment below from Laura Hudson, as a suggestion to add the “I” to the model, so that marketers can also use this tool in budgeting discussions with the CFO. My team will certainly pick this up. With that addition, the model will still not replace internal accounting practices needed to report a company’s income statement and intangible assets (goodwill). But I hope it will help improve the success of marketers and the numbers in the annual reports.